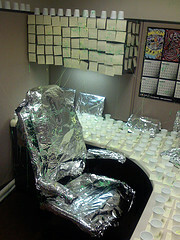 This morning we’re initiating a new category of office pranks. If you’ve got pranks you’d like to share, send them in. This little doozy is an annoying prank you can pull on anyone who has a Windows computer. In essence, when the victim is away, you take a screenshot of their desktop. Then you turn off all the desktop icons and make your screenshot become the wallpaper. When the victim returns to his or her computer, they’ll see their normal desktop just as they left it. But somehow… none of the icons work. They’ll click and click and click, but nothing will happen. lololololololololol! im so going to do that to my english teacher!